AEG has struck a naming rights deal with Farmers Insurance Exchange on the planned NFL stadium downtown that&apos;s worth $700 million over 30 years, according to ESPN Los Angeles. The deal means you may be flocking to see football games at "Farmers Field" but many hurdles remain before construction could begin on the newly named venue, including an environmental impact review, a complete entitlement process and agreement on a long-term lease with the city. AEG president and CEO Tim Leiweke has also proposed the city issue $350 million in bonds to add an extension to the convention center and increase parking in the area. 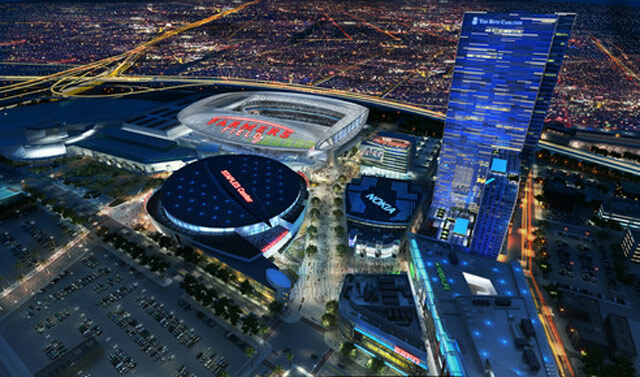 Ed Roski of Majestic Realty, however, has a different vision of what bringing the NFL back to L.A. could look like and he thinks his 75,000-seat open-air football stadium in the City of Industry is a much better bet than AEG's downtown plan. John Semcken, VP of Majestic Realty, thinks AEG's plan will unnecessarily burden everyone involved in the venture. "AEG is expecting taxpayers to dole out well over a billion dollars for a proposal that will compromise the City's general fund, the L.A. Convention Center, the new stadium and the financial success of any potential NFL team." Leiweke called Semcken's comments "fear tactics" and promises that come Super Bowl Sunday, there will be "an an announcement that proves to everyone once and for all that this project is going to happen. It's going to be private and it's going to be brilliant and it's going to happen." Well, ok.
Are you excited about heading to a stadium called Farmers Field for future would-be NFL games? Or were you hoping for a different naming outcome? The formal announcement/press extravaganza surrounding the announcement is currently underway. We'll have more news once the event is over.